Recently, my mother in-law has been buying leeks quite often after finding out that we like it. It is really delicious if you know how to cook it. Marinate chicken with the rest of the ingredients A and set aside. Combine ingredients C in a small bowl and set aside. Heat up oil in a wok over medium low heat. Saute garlic and ginger until slightly brown and add in marinated chicken. Stir fry for short while until the chicken turn white. Turn heat to medium. 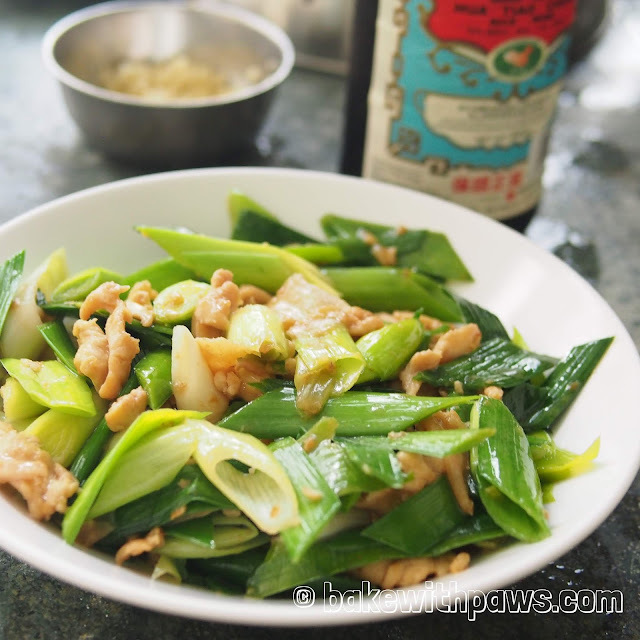 Add in Shaoxing wine and salt, then the leeks. Stir fry until the leeks is almost cook. Add some water if too dry. Slowly stir in the corn starch mixture. Once the sauce thicken, off the heat.